This post does eventually relate to archives. When I got home from the march, I spent some time looking at photographs people were posting of marchers and their posters. Here are some interesting articles related to posters from marchers and photographs round the world and within the United States. The Society of American Archivists’ Women Archivists Section is interested in archiving materials, including posters, photographs, and oral histories from the women’s marches. Their project is called the Women’s March on Washington Archives Project. Click here to find the Project’s Facebook group and here for their Twitter account. I plan to contribute photos. Some friends also gave me their posters. I just have to find out if California has a repository for the physical materials. Please feel free to share about this archival project. This could be a potentially rich source of primary material for those studying about the marches in the future. Here are some photos I took this weekend. I wrote this for the CJCLS Blog. Earlier this week, I wrote about how to promote reading on the CJCLS Blog after we came across some incorrect reading stats that have been widely circulated on social media. Yesterday, a list of all the books President Obama has recommended during his presidency was released. What a great way to promote reading…and a great way to round out that earlier post. There was interest related to some posts about search trends on the CJCLS Facebook page, so I put them in a post for the CJCLS Blog. I wrote this for the CJCLS Blog in reference to a photo that was posted to the CJCLS Facebook page a couple of weeks ago. I have been collecting links related to fake news and media literacy for several weeks. The topic seems to have exploded since Stanford released its “Evaluating Information: The Cornerstone of Civic Online Reasoning” report in November. Also in November, the California State Auditor’s office released its report “School Library Services: Vague State Laws and a Lack of Monitoring Allow School Districts to Provide a Minimal Level of Library Services,” in which I learned that “California has by far the poorest ratio of students to teacher librarians in the nation.” Somewhere along the road, it seems that librarians were equated to finding information, and in the “age of the Internet” where anyone can find things, I have often heard the obsolete speech. At my previous job, there was a committee set up to discuss whether the college’s AA and AS degrees (not for transfer) needed to fulfill an information and computer literacy requirement. One of the administrators thought that in the age of Google Chromebooks, there was “no need.” I left that job before a decision was made, and I discovered that the requirement was removed. Given the present state of information literacy, this is a mistake. Since before the holidays, the instruction team and I at UC Merced have been developing a digital campaign for our social media accounts and digital signage related to becoming an informed news consumer. (The idea was sparked by this graphic you may have seen before.) Unrelated to this initiative, we’re also pitching a more robust instruction menu, and one of the options is about media literacy. My colleague developed a lesson plan, but I will need to get her permission to share it. Recently, there was a call from Linda Miles at Yeshiva University in the collib listserv for lesson plans related to media literacy. She’ll be sharing those findings soon. If you’re interested, Programming Librarian will be offering a free 45-minute webinar “Post-Truth: Fake News and a New Era of Information Literacy” on Wednesday, Feb. 22 at 2 pm EST. Register by clicking on this link. 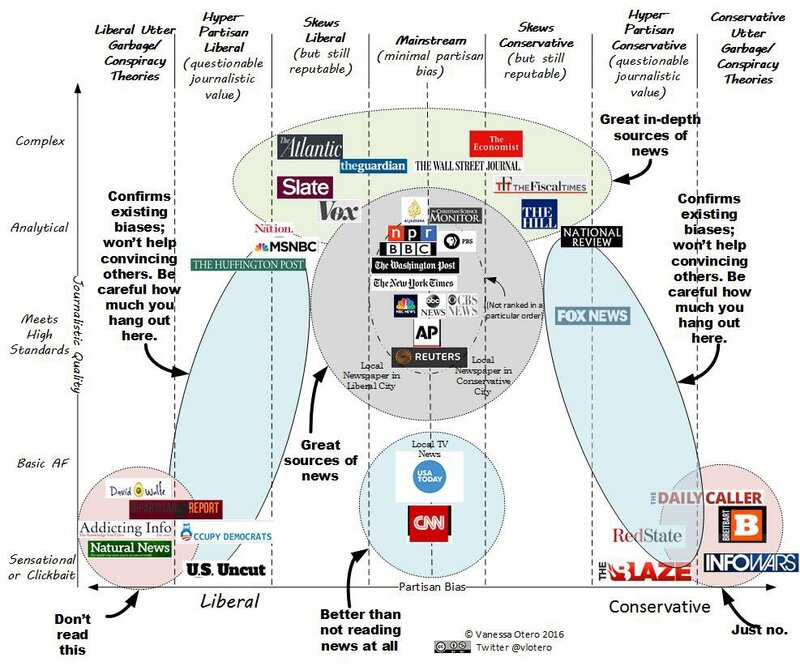 My goal for this post is to share the links related to fake news and media literacy that I have been collecting for the last few weeks. I’m sure this sort of project is already in the works (indeed, I even signed up for Twitter again specifically for this topic…), but this is my attempt at a Fake News and Media Literacy Syllabus that can help academic librarians who teach information literacy. The link takes you to a Google Doc that can be edited. Feel free to add articles, tools, lesson plans, LibGuides, etc. to the Syllabus or to this post. I would love for folks to add their names and affiliations as well. I plan to do official citations later, as well as some kind of organization that makes sense. There is tons of stuff I haven’t added, but we’ll get there.